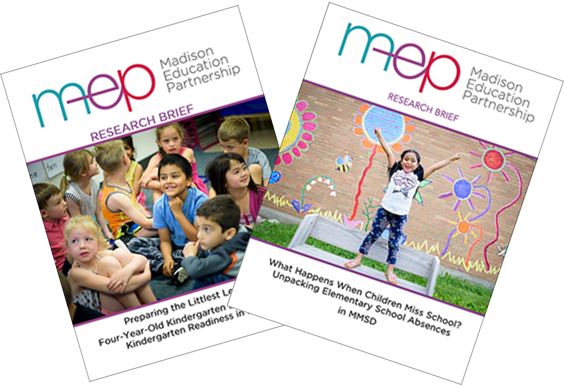 The Madison Education Partnership (MEP) was established in 2016 as a research-practice partnership (RPP) by leaders of the Wisconsin Center for Education Research (WCER) and the Madison Metropolitan School District (MMSD). MEP brings together UW researchers and MMSD staff to define and address critical issues relating to student achievement and equity in the Madison school community. A clear Research Cycle is coordinated through MEP. Critical questions within MMSD are brought to the MEP discussion table. UW and MMSD representatives collaborate to set priorities, design a research strategy, identify data to collect, and set up analyses that will lead to deeper understanding of the issues and implications, as well as potential responses by district leaders, policymakers, and other stakeholders. Faster turnaround of research and analysis is one of the many advantages of MEP. Results are shared with decision-makers immediately following analysis (rather than later, after journal publication), so that district leaders can use findings to make strategic policy and practice decisions. Though quickly accomplished and locally-based, MEP’s research is up to peer-review standards and has national relevance. Across the nation, RPPs are working on local problems with national consequences. See the National Network of Education Research-Practice Partnerships. MEP Directors oversee all MEP operations and direct research projects. Along with staff based at WCER, they engage with local stakeholders, MMSD leaders, school practitioners, and supported researchers—to advance studies and results sharing, and to support practice and policy changes related to student achievement and equity. Supported Researchers are awarded special, limited-term grants to carry out research projects that complement the research conducted by the MEP Directors. A Steering Committee made up of UW faculty and MMSD staff meets quarterly. The committee offers MEP guidance on research topics, reviews supported work proposals, research-related recommendations, and community engagement. The committee helps assure all research is high quality and useful. An Advisory Group is comprised of community stakeholders. Twice a year the group meets with MEP to provide critical insight about stakeholder contexts, additional research opportunities, and considerations about community engagement. WCER and MMSD leaders and researchers mutually define and investigate problems relating to student learning, equity, and district-wide concerns, then collaboratively identify responsive policies and solutions based on results. This diagram is a simplified picture of MEP’s iterative research process. A more complete diagram is forthcoming on our Research page. Research Briefs are one way MEP shares its work. See publications.